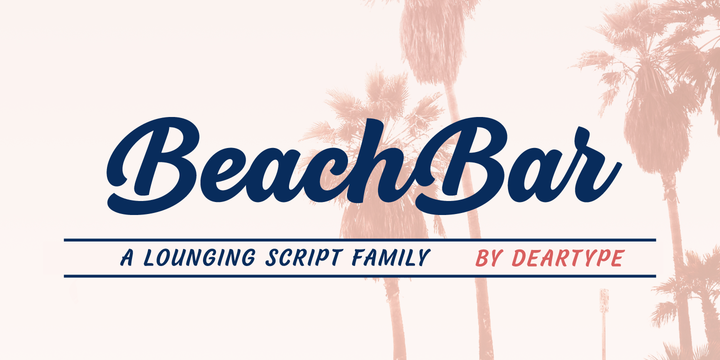 BeachBar is a contemporary typeface created by Veneta Rangelova and published by DearType which was inspired by sunny summer days, hot beaches and beach bars. It comes in 3 styles (Regular, Alt & Script) each with six weights (from Regular to Heavy) ideal for yor projects. This versatile font merge well for any kind of project from text, headline, poster, packaging to web and print. Enjoy! A font description published on Tuesday, August 16th, 2016 in DearType, Fonts, Veneta Rangelova by Alexandra that has 7,012 views.